Birthdays come once a year. Along with this joyous day of birth, brings with it all sorts of festivities. Parties filled with people. Parties filled with music. Parties filled with games. Parties filled with decorations. Parties filled with booze. Parties filled with food. But most importantly, parties filled with cake. As we get older we no longer look forward to extravagant get togethers with obscene amounts of gifts. The big things do not matter to us anymore. Rather we take comfort in the little things. The loved ones that surround us. The hugs and kisses we receive. We take solace in the good times and memories we create, instead of the number of presents on the table. The tearing of beautiful paper that hugs the packages, just isn’t important anymore. Good food, wine, company and laughs are all we need. In fact there are even some instances, a year here and there, in which we might forget that our birthday is near. We overlook the idea of our special day on the horizon. As if by not keeping track of this day will make the prospect of us getting older any less realistic. No, ignoring it will not work. Pushing it off and out of our minds, will not turn back the hands of time. We won’t get any younger by denying the day, no matter how many times we pretend to be a certain age. Once we lose the fascination of presents, cake takes over and becomes our main priority. Delicious cake, high towards the sky, is what excites us about our day. As our age grows in number, the candles start to dwindle. No longer is it fun to put the exact amount of candles on the cake. Covering it with a vast array of dancing flames, with which illuminate are eager faces. Perhaps it’s because lighting that many candles takes too long? Maybe we do not want to buy that many candles? It could also be because lighting one sole candle is so much easier and less dangerous. You can put that fire extinguisher down and put away the rest of the candles, as one is more than enough for me these days. Whatever the case may be, that edible centerpiece is now the most important aspect of the celebration, when it comes to birthdays. It’s our day and therefore we have the right to indulge in a piece-or two-of cake. And why shouldn’t we? Age is just a number and we cannot look to it to define us. We’re not getting older, we’re just getting seasoned. Look onto those youngins and be content in knowing that we have that many more years of knowledge ahead of them. Many more years of experience and life lessons that have taught us oh so much, than they do. In fact, feel sorry for them. Feel sorry because they are not at your age. You got to an age that has taught you so much. Sure we might complain, every so often, that we’re getting old and dreading our next birthday. But what you have to remember is that no matter how old you turn, there will always be someone who is older than you. There will always be someone who you cannot compete with. And that someone-or something I should say-is America. Yes, we forgot about the little detail that America has a birthday too. America does not need any presents. It does not look for or expect birthday cards and balloons. But what it does need. What it does deserve, is cake. But oh no, a regular cake will not suffice. An plain and ordinary vanilla or chocolate cake will not do. America deserves something special. Something fantastic and delicious. 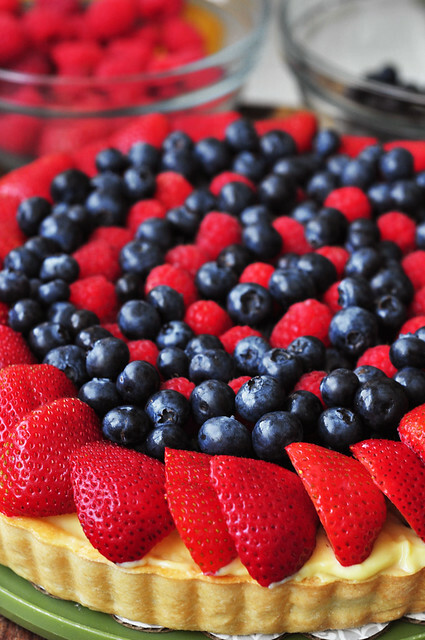 It needs to have a triple berry tart. 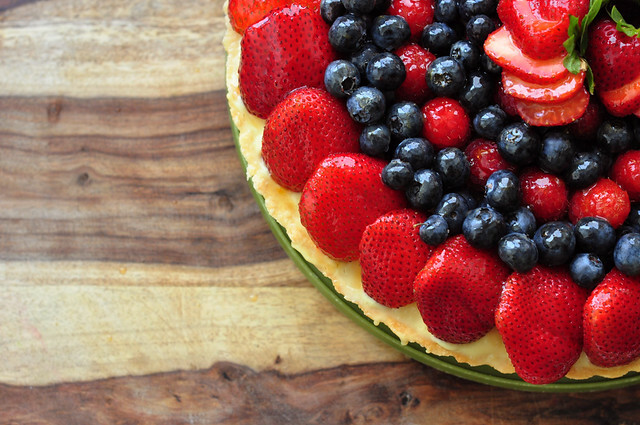 A tart topped with ridiculous amounts of strawberries and blueberries and raspberries. Fresh berries. Fresh strawberries and fresh blueberries and fresh raspberries. 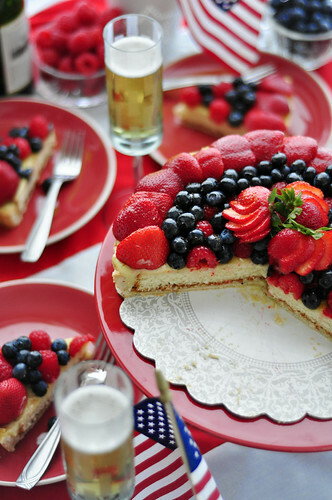 Delicious berries. While you’re at it, put a candle on it and let’s sing Happy Birthday to the United States. If getting older requires a fake age, then America definitely needs one. Happy 236th Birthday America. Thanks for all the good times and happy memories. I will however, not thank you for the hot weather and treacherous sun, of whom I hate so much with a passion. But that’s another story, America. Another story for another time. 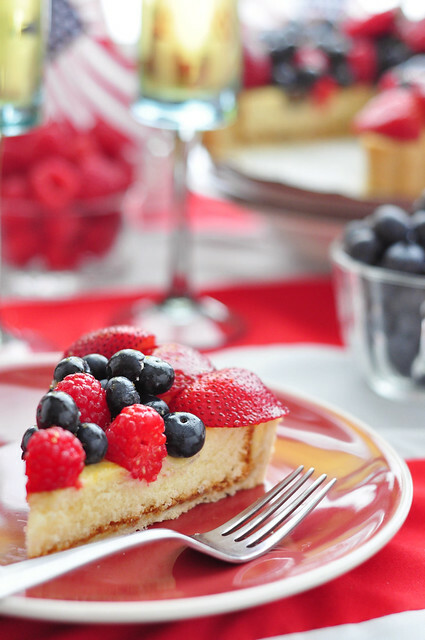 This time you shall enjoy your mixed berry tart in peace. This tart plays out in four acts. 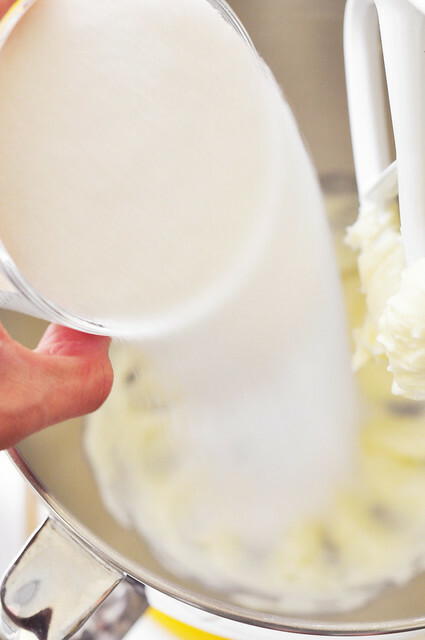 The first act is to make the pastry cream. The second act is to make the tart shell. 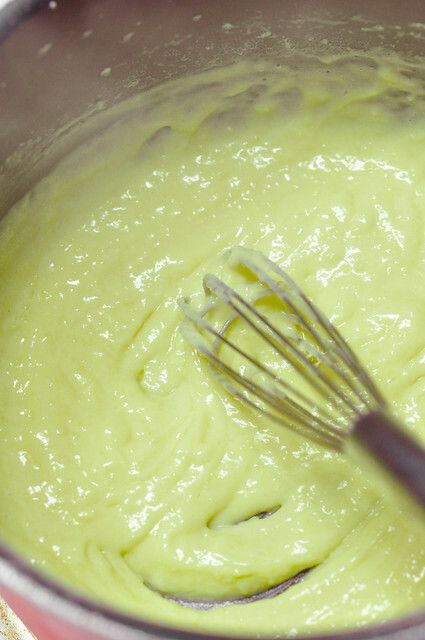 The third act is to make the yellow cake. 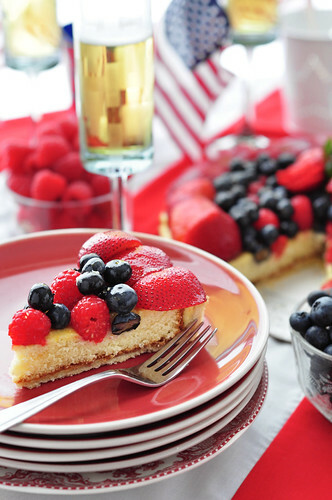 And the final act is to decorate with fresh berries. Queue fireworks. Drop the banners. Wave the flags. Let’s start with numero uno. Here is what we’ll need…. 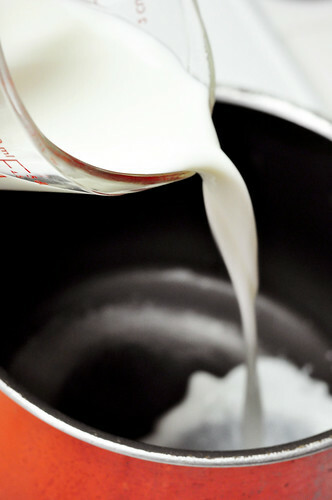 Pour the milk and a 1/4 cup of the sugar-reserving a tablespoon-into a medium sauce pot. 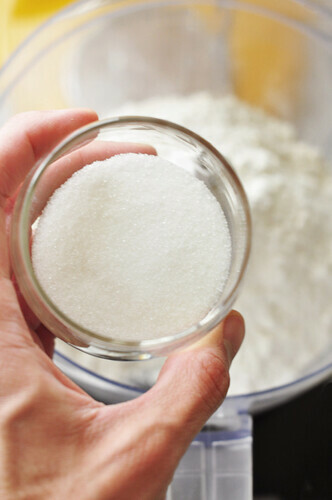 Allow the sugar to dissolve and bring the milk to a slight bubble. Do not boil. 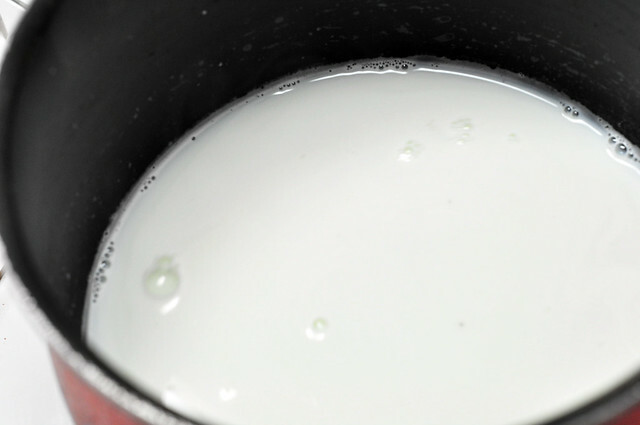 Watch carefully, and remove from flame as soon as you’ve scalded the milk. Meanwhile, let’s separate the eggs. 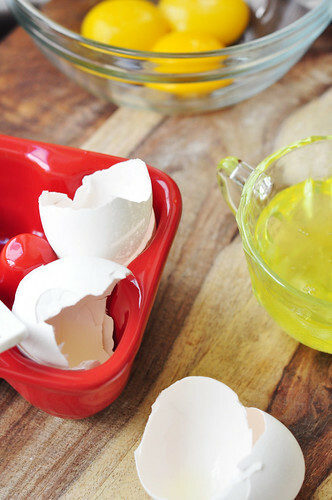 We need three egg yolks. I normally just separate the eggs the good old fashioned way. 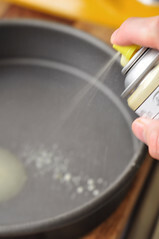 By juggling the yolk between the shells and allowing the white to fall down, but since I have to hold the camera with one hand, I use this handy dandy egg separator. 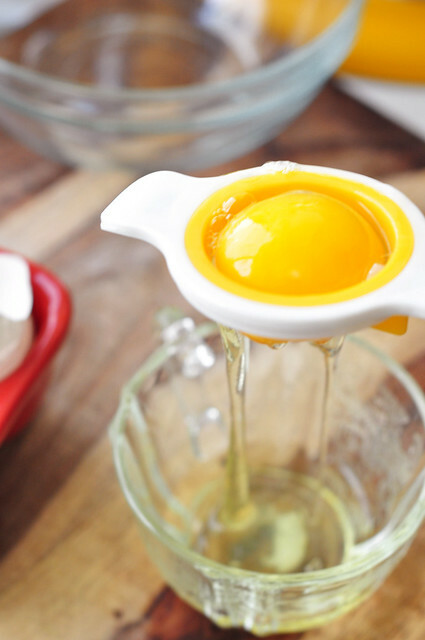 If you want to be just like me, get a handy dandy egg separator, and separate all the eggs in your refrigerator. Why? Because it’s fun. 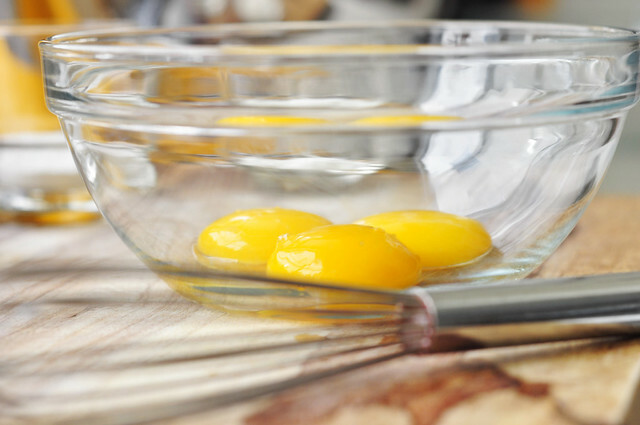 Anyhow, dump the yolks into a large mixing bowl. 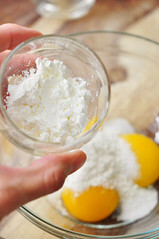 To the yolks add the cornstarch, flour and the reserved tablespoon of sugar, from earlier. 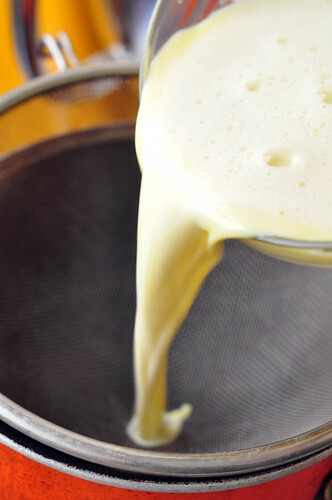 Whisk the ingredients together, until completely smooth, thick and pale in color. 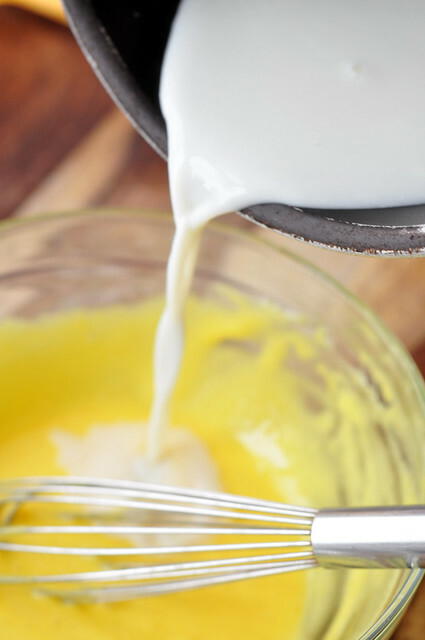 Grab the scalded milk and slowly stream in the hot liquid into the egg yolk mixture while whisking thoroughly. This is called tempering the eggs. This will ensure that the eggs don’t scramble. Once the milk is completely added and is whisked together with the yolks, pour the mixture back into the pot; passing it through a sieve. 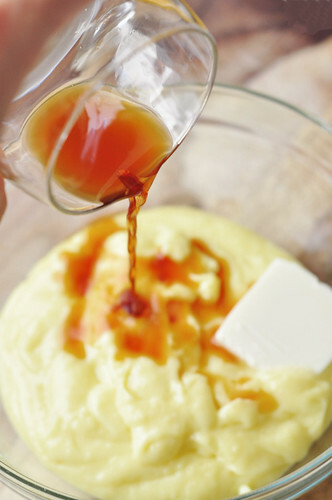 That step will remove any lumps from the mixture. Place the pot back on the stove over med-low heat. 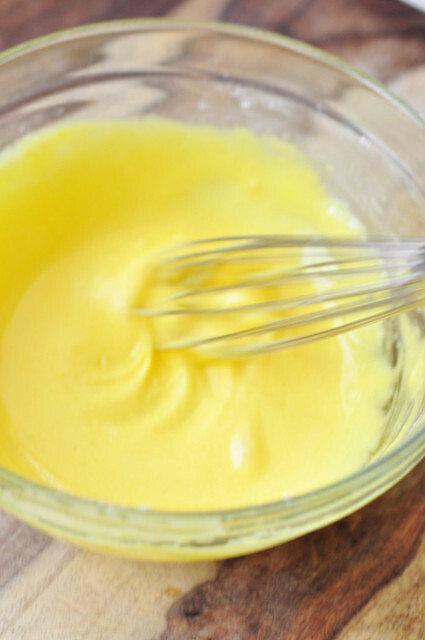 Whisk until the custard has thickened. 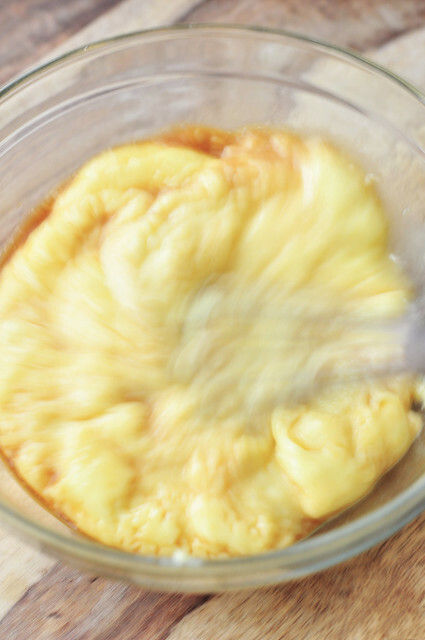 After about five minutes the pastry cream should be ready. 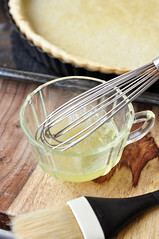 When done, remove from the heat and transfer the pastry cream to a bowl. 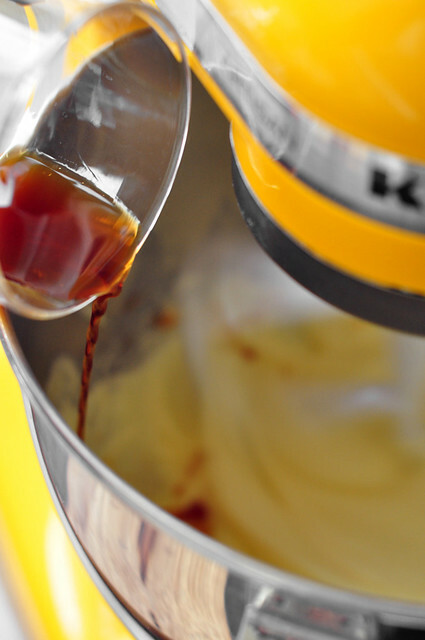 To the finished cream, add the butter and vanilla extract. 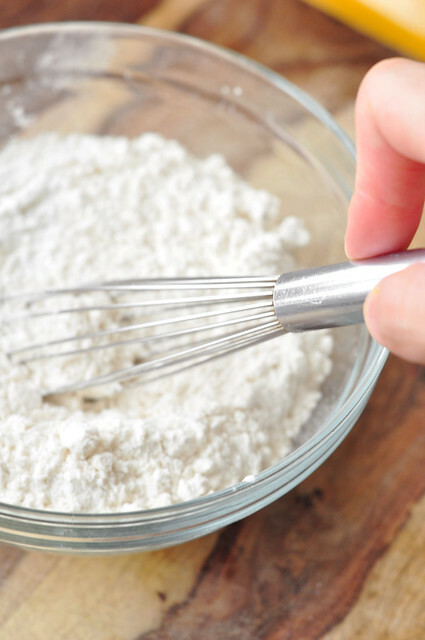 Give it a good final whisk. It’s time for this to go to the fridge. We need it super duper cold before we use it. So wrap it up and let it chill. 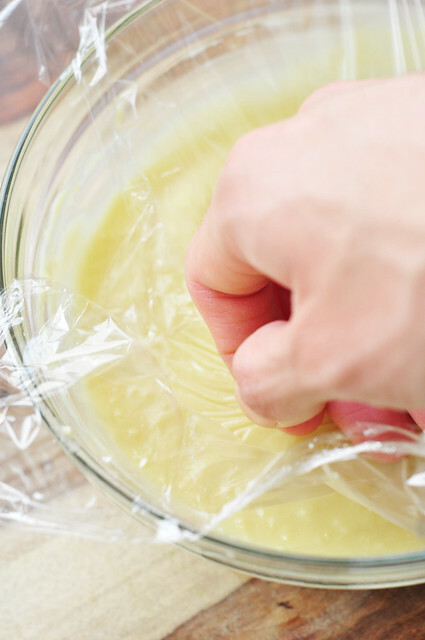 Place the plastic wrap directly onto the pastry cream so that there is contact. 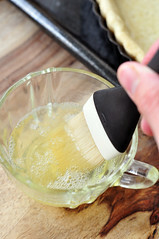 This will prevent a “skin” from forming on the pastry cream. 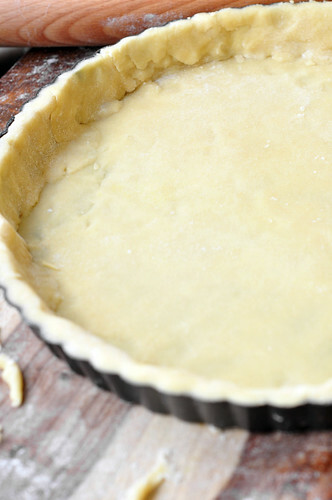 The next thing we’re going to do is the crust for our tart. 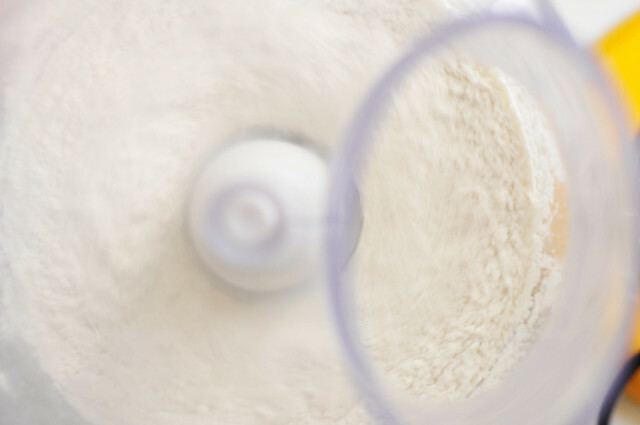 Pour the flour and sugar into the bowl of a food processor. Pulse a few times, with the lid on of course, to combine the two ingredients. 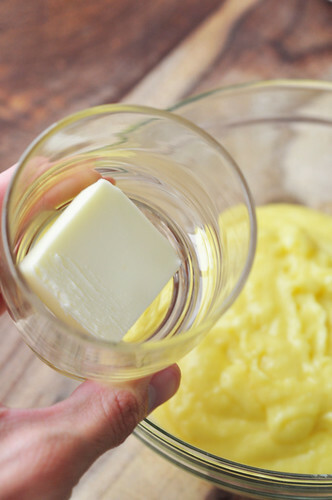 Add the cold cubed butter to the dry ingredients. Place the lid back on and pulse for about 7 times, the butter should resemble the size of peas. 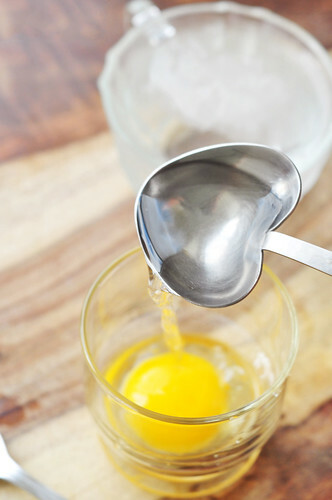 Add the ice water to the egg yolk and whisk together. 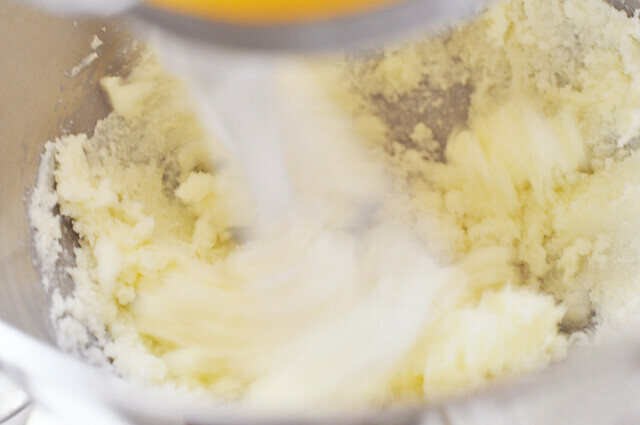 Pour the wet mixture into the dry ingredients, while the food processor is on. 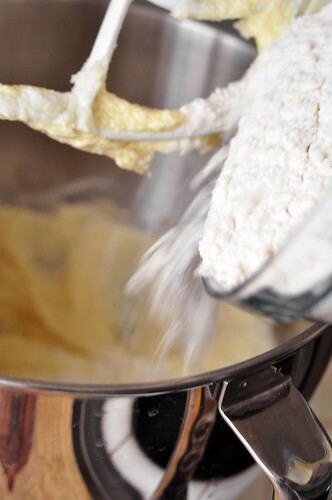 The dough should lump together and come away from the sides of the bowl. 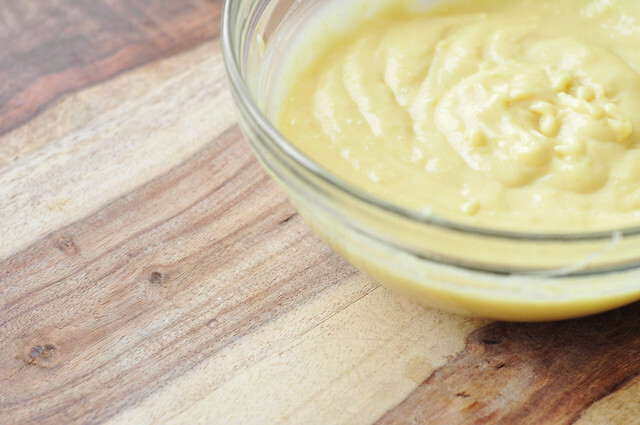 Turn it out onto a cutting board, or work surface. Form it into a disc and wrap in plastic wrap. Place in the fridge and allow to chill, alongside the pastry cream. Meanwhile, let’s make the cake for the filling. This is a yellow cake recipe. Below is how you make yellow cake. 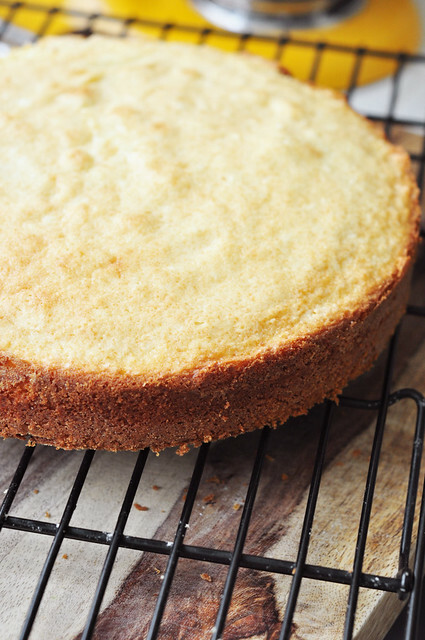 Moist and yummy yellow cake. 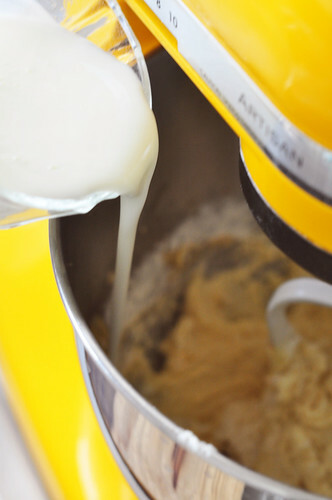 Start by creaming the softened butter. Let’s get the dry ingredients ready. 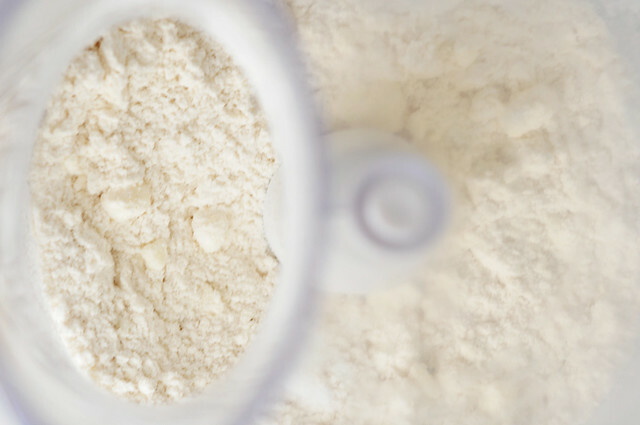 You’ll need a bowl of flour. 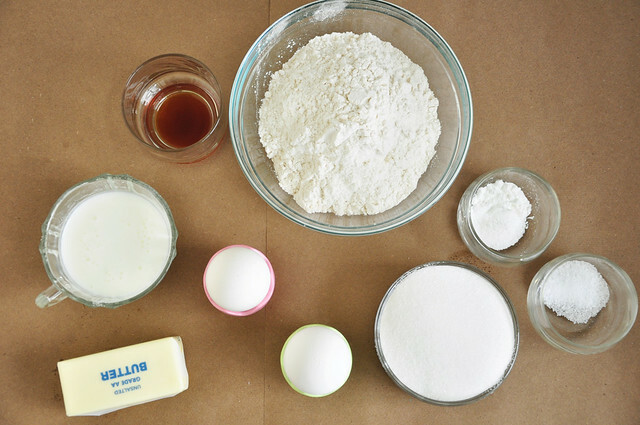 Add the baking soda, baking powder, and salt. 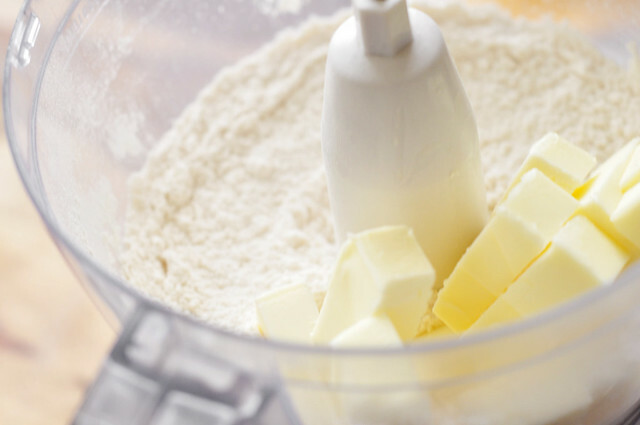 Give it a whisk or sift. 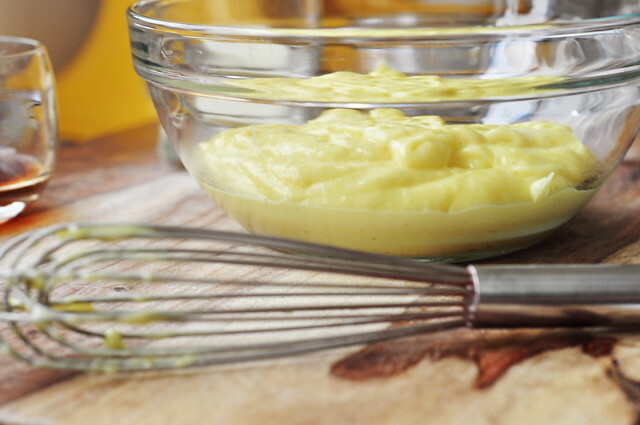 Add the eggs to the creamed butter and sugar, one at a time. Mix well after each addition, before adding the next. 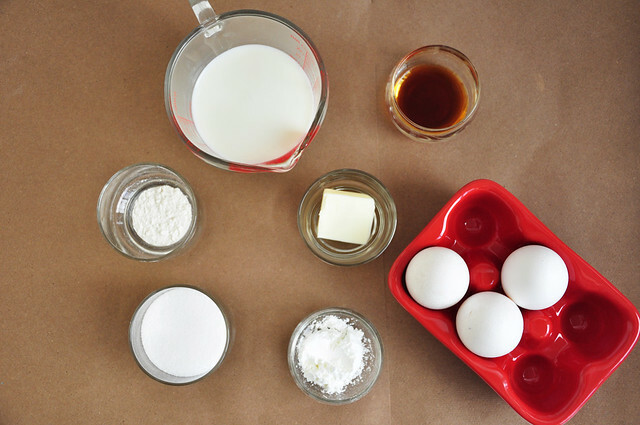 Throw in the vanilla extract. 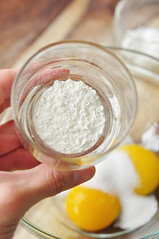 Next, add the dry ingredients and the buttermilk; alternating between the two. 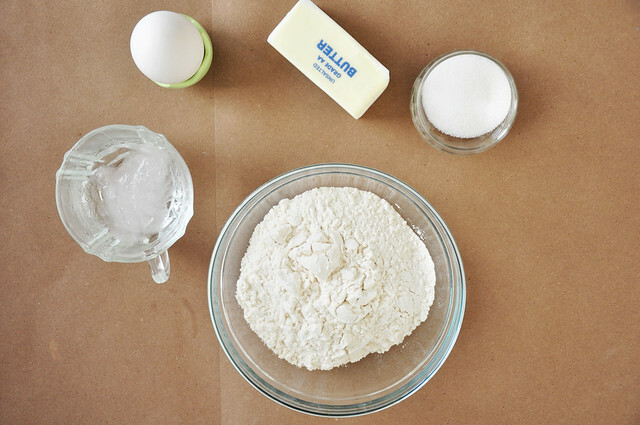 Make sure to start and end with the dry ingredients. 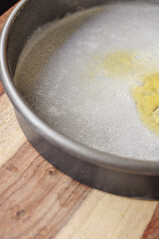 Grease and flour a 9-inch round cake pan. 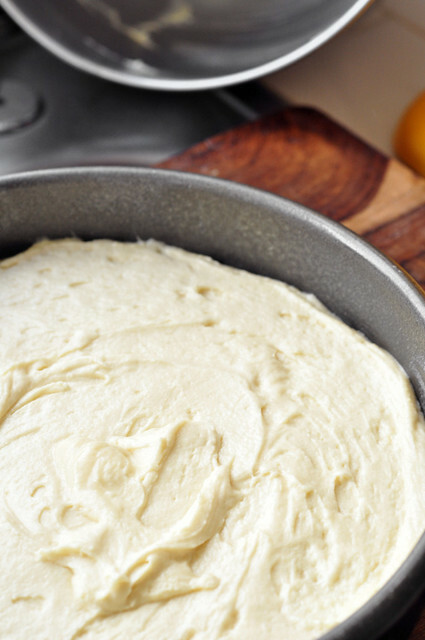 Pour the cake batter into the prepared pan. Bake in a preheated 350° oven for about 35-40 minutes. Or until golden brown and a toothpick, inserted in the center, comes out clean. 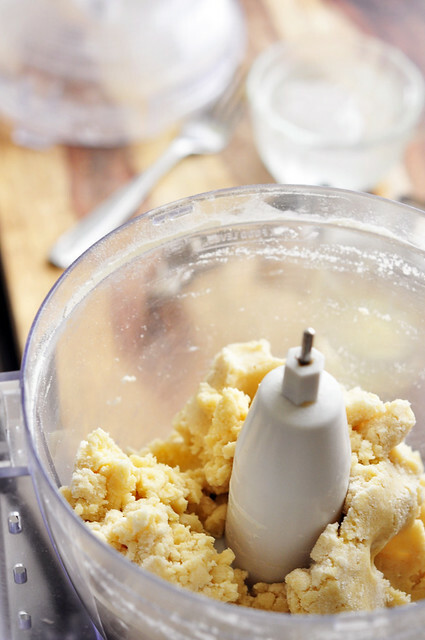 While the cake bakes, let’s get the tart dough ready. It should be cold by now. Flour a work surface, I’m using a cutting board. 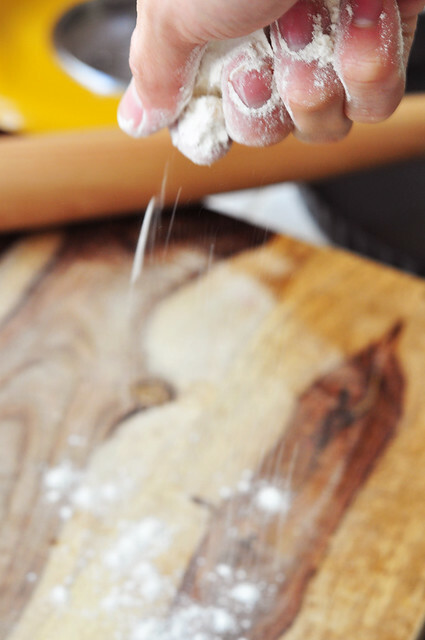 Place to dough on the floured surface. Roll it out into a large circle, about a 1/4 inch thick. 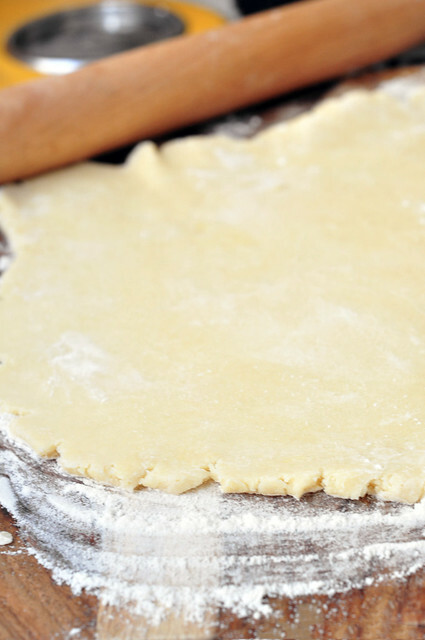 Transfer the rolled dough, carefully, onto the tart pan, and form it up the sides. 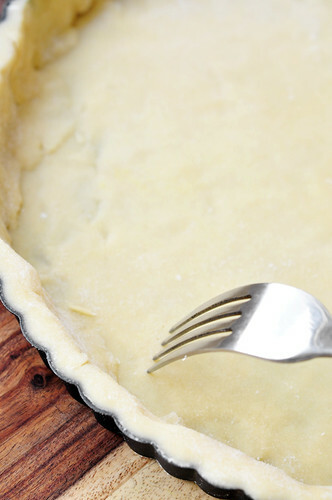 Using a fork, poke holes all throughout the bottom of the tart. 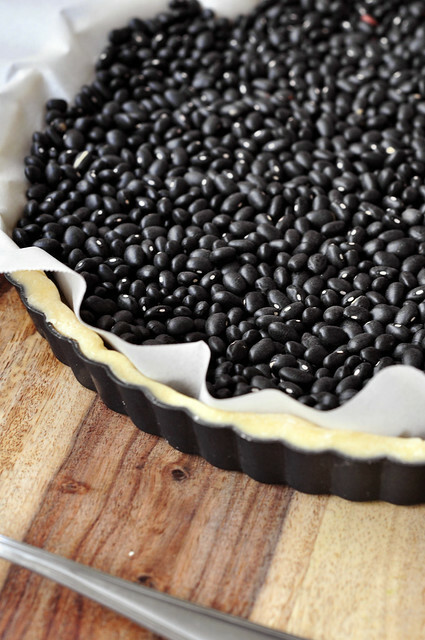 Place a sheet of parchment paper over the tart, and fill with either dry beans or baking weights. I do not own baking weights, so I just use dry beans. Why waste money? Might as well make double uses out of things you have on hand already. 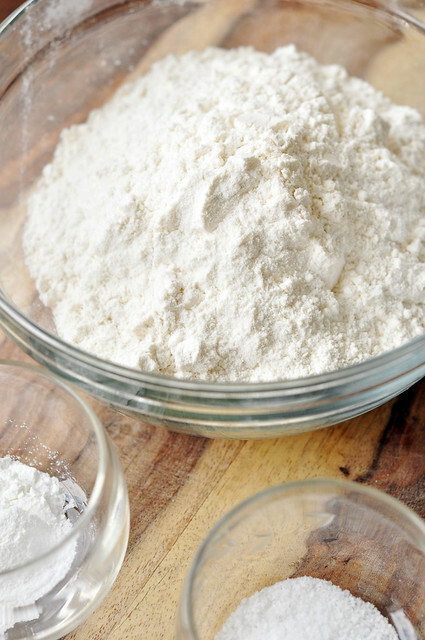 This will prevent the dough from puffing up in the center while it bakes, and it will prevent it from browning too fast. Place in the 350° oven alongside the cake and bake for about 40 minutes, rotating halfway. By now the cake should be done. Remove from the oven. After 40 minutes, remove the tart shell from the oven and carefully take off the parchment paper with the beans. 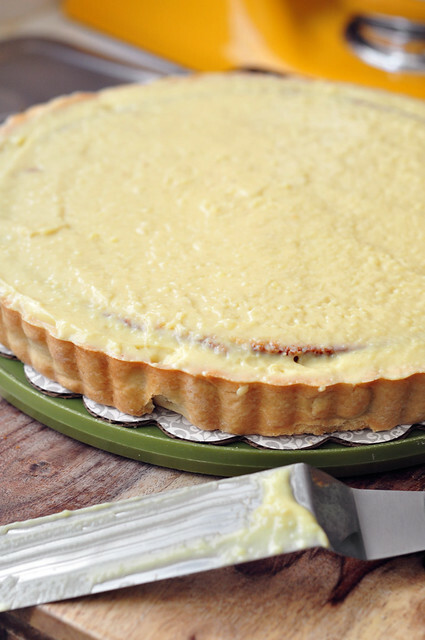 The next step is to brush the tart with an egg white wash, this will prevent the tart from getting soggy when the custard is placed. Return to the oven and bake for an additional 10 minutes, uncovered until golden brown all around. Allow the tart shell to cool completely on a wire rack. Back to the cake. After it has cooled for a bit, invert it from the pan and allow to cool completely as well. 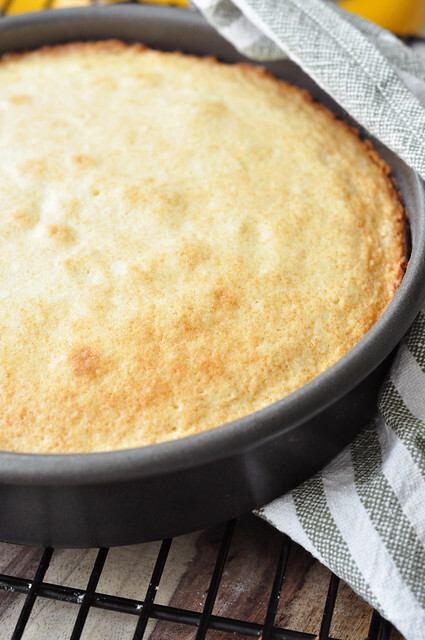 Once the cake has completely cooled, place on a cutting board. 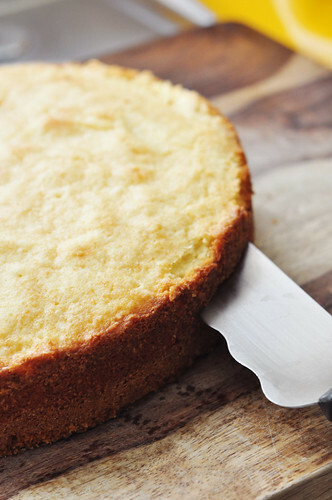 Using a serrated knife, cut the cake in half, so you end up with two thin cake layers. 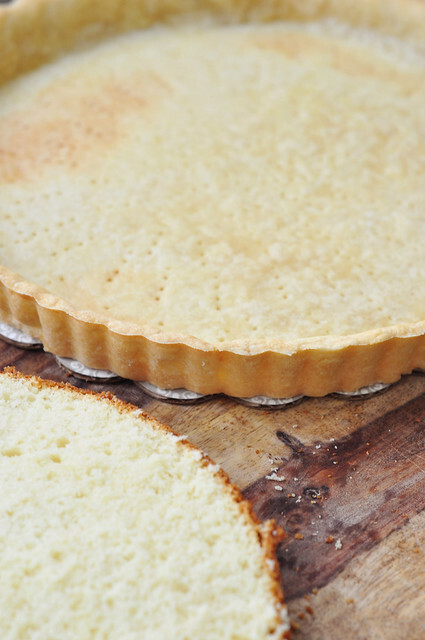 Next, remove the tart shell from the pan and place on a serving plate or platter. I like using a disposable cake plate, cardboard type thing. 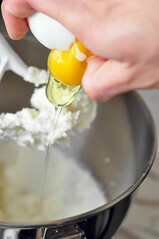 Place a dollop of the pastry cream on the shell. Place a cake layer on top of it. You only need one of the cake layers. So this means that the second layer can be eaten as a snack. Can someone say best snack ever? I think so. I think so. 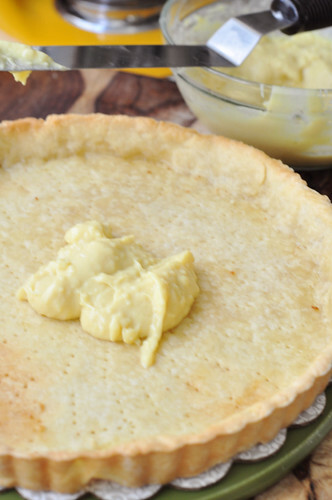 Top with the rest of the pastry cream. 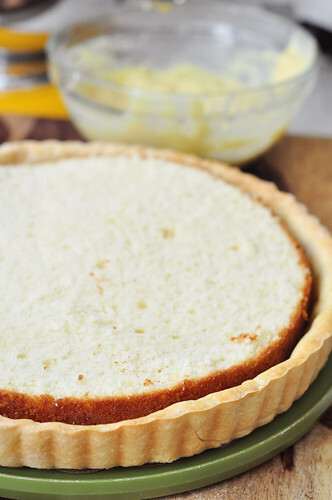 Spread it out, covering the tart completely with the cream. The tart is ready to be topped and decorated. Cut off the tops and slice in half. 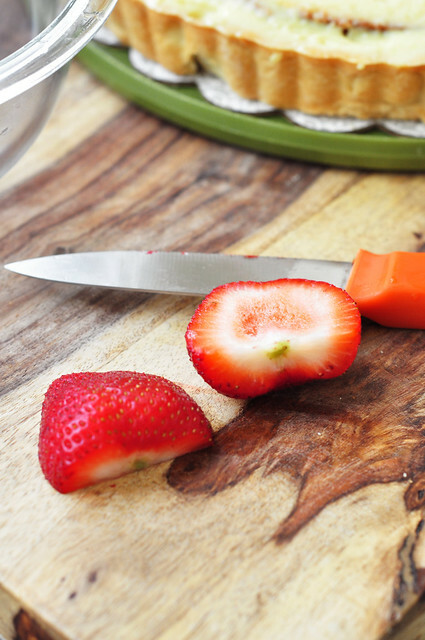 Once the strawberries are prepped, grab some blueberries and raspberries. 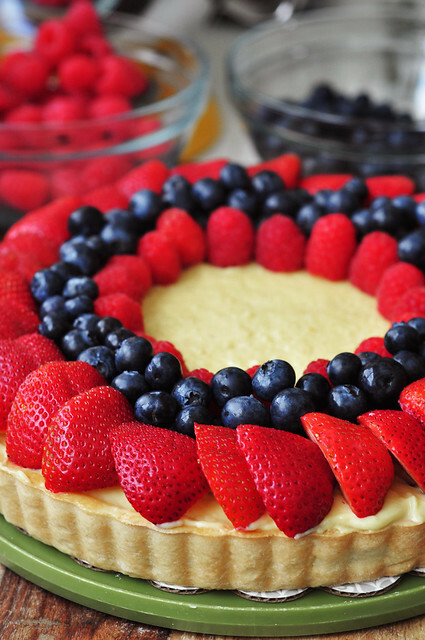 You can decorate the tart with the berries, any which way you’d like. What ever your hearts desire. Either by placing them in a pattern, nicely, or a more rustic approach by scattering them all on top. I’m going with the placed nicely way. I’m wearing my fancy pants today so I feel like being precise. 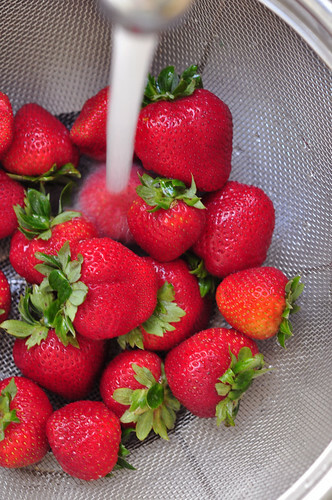 I start with a row of strawberries. Then a row of blueberries. Then a row of raspberries. 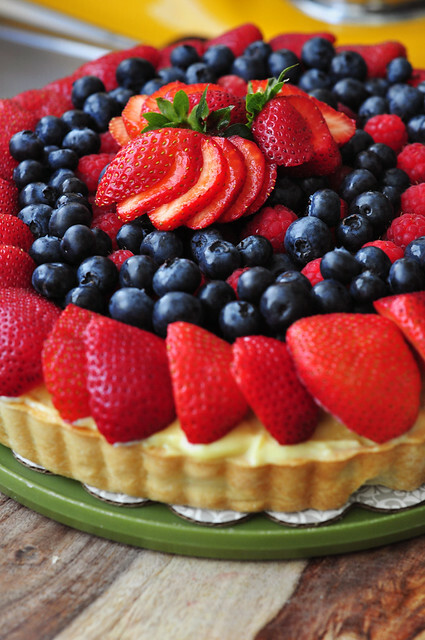 Continue in this manner, until the tart is filled with berries. A row of blueberries. A row of raspberries. A row of blueberries. And so on and so forth. Top with a little sliced strawberry garnish. Well the answer is NO! We’re not done. We need one final step. 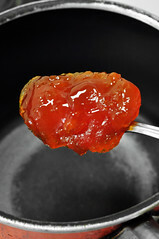 To make the glaze throw in a spoonful-a heaping spoonful-of apricot preserves in a small sauce pot. Stir together and bring to a boil. 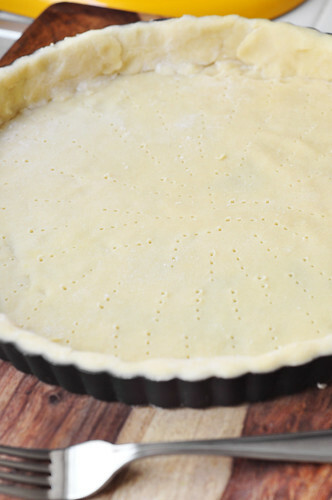 Once the glaze is hot, bring it over to the tart. 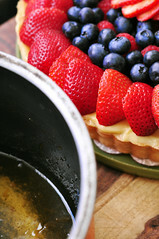 Completely glaze the top making sure to brush each fruit until the tart glistens and shines and glistens and shimmers. There ya go. Now the tart is done. Look at it. It’s all shiny and delicious looking. Cut the tart. I command you. Happy Birthday America. May you have many more wonderful birthdays to come. And may you continue to be my home for the rest of my life – but that’s a given. 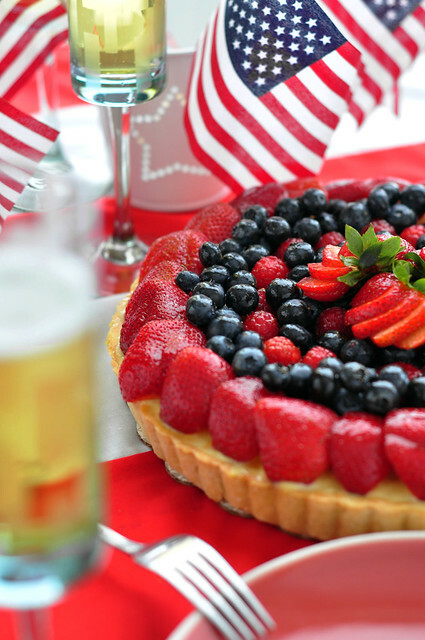 Make this tart for the party you’re throwing to celebrate America’s birthday. 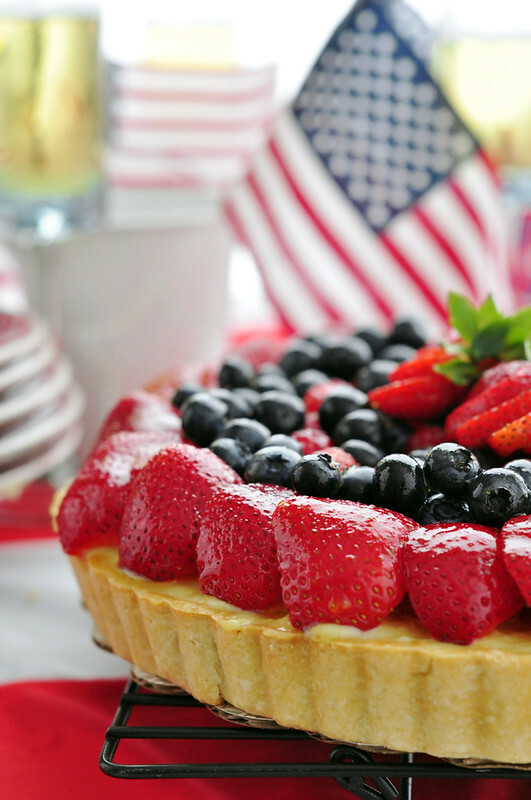 Make this tart for your family and friends. 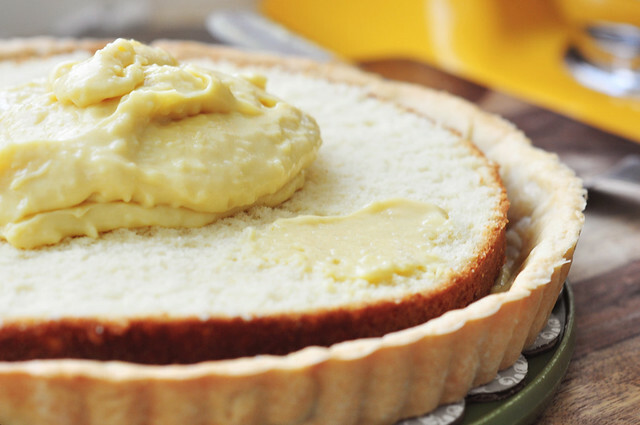 Make this tart to show off your excellent baking skills. 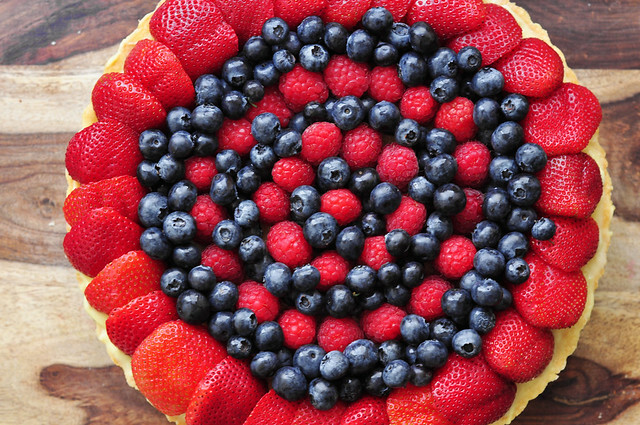 Make this tart to show off your excellent decorating skills. 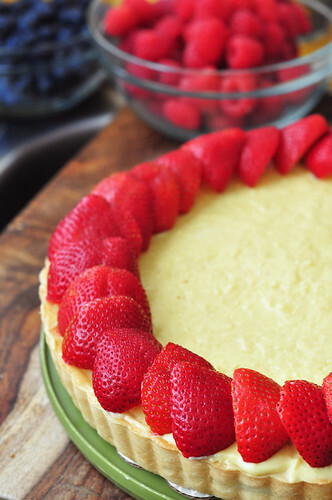 But more importantly, make this tart so you can eat it. Taken and adapted from Martha Stewart Living. 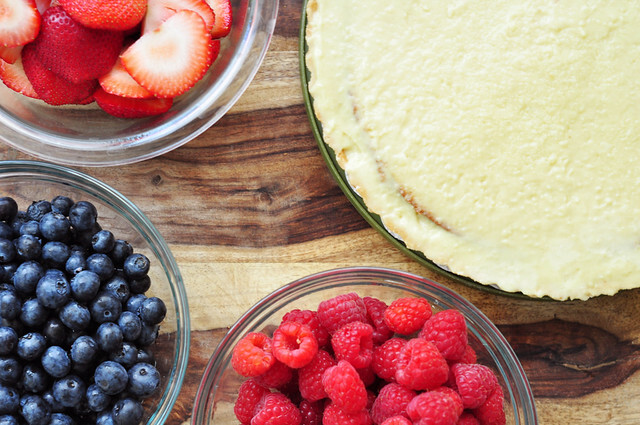 This tart can be topped with any assortment of fruit you’d like. 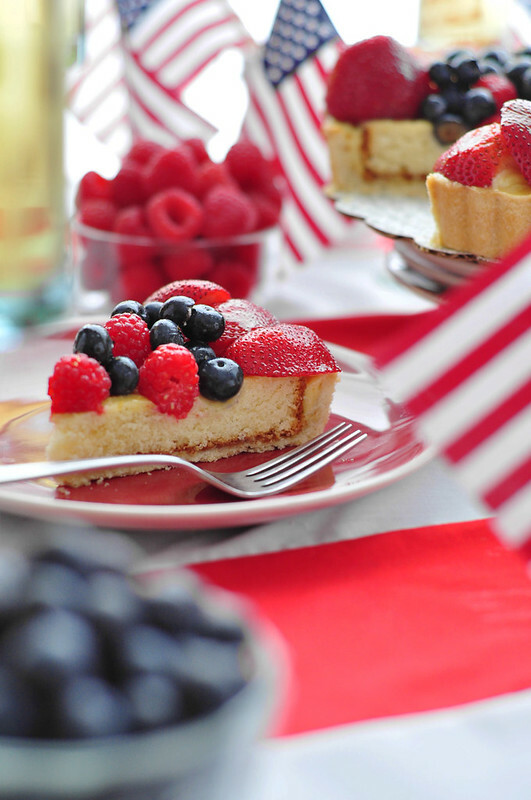 Do not like raspberries, blueberries or strawberries? Well, you’re weird. But regardless, you can top it with your favorite fruit instead. It’s the perfect summer treat for any occasion. 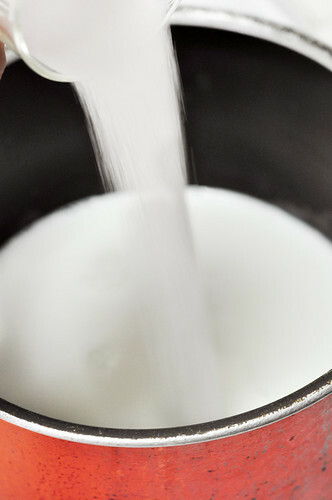 Place milk and 1/4 cup sugar in a medium saucepan over high heat; cook until almost boiling. 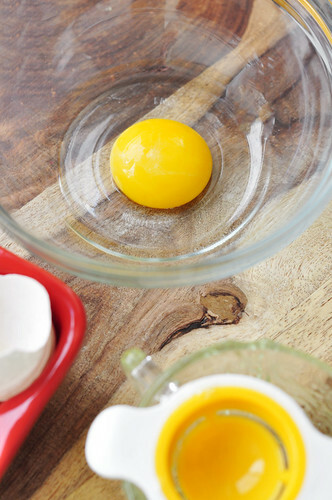 In a medium bowl, whisk together egg yolks with remaining 1 tablespoon sugar until thickened. 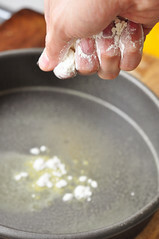 Sprinkle in cornstarch and flour and continue beating until well combined. 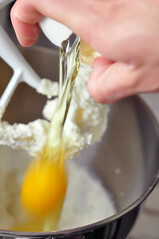 While whisking constantly, slowly pour heated-milk mixture into egg-yolk mixture. 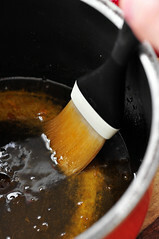 Pour mixture through a fine sieve back into saucepan, and cook, whisking constantly, over medium-high heat, until it thickens and registers 160 degrees on an instant-read thermometer, about 2-5 minutes. 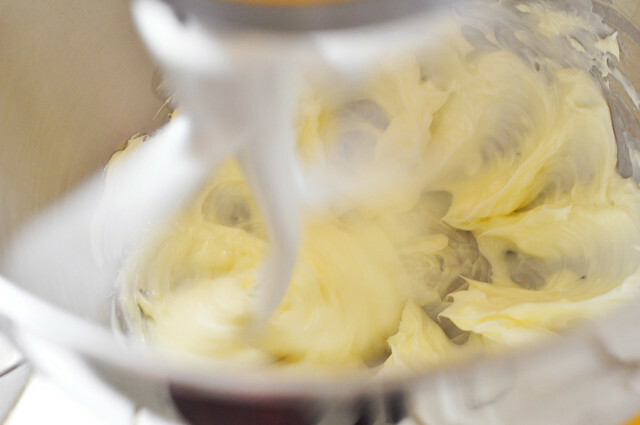 Transfer to a large bowl and whisk in butter until melted. Add vanilla extract and whisk once more. 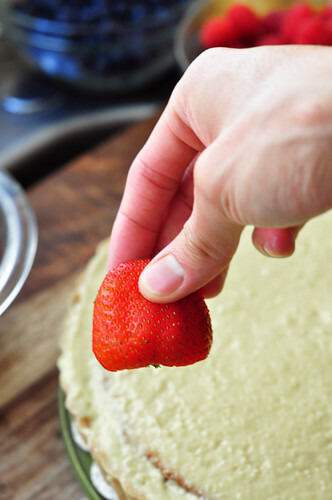 Cover with plastic wrap, pressing it directly on the surface of the pastry cream; refrigerate until completely cooled. About 1 hour. 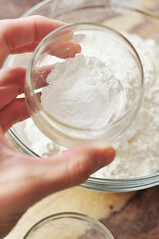 After an hour, lightly flour a work surface, roll out dough to a 12-inch round, about 1/4-inch thick. 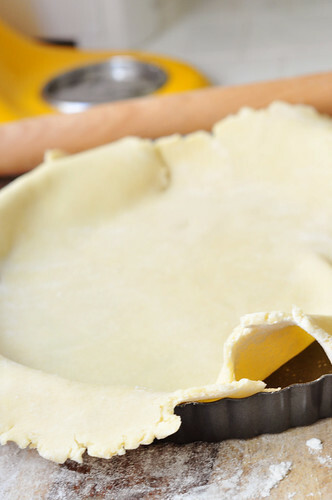 Fit dough into a 9-inch round fluted tart pan with a removable bottom, pressing into edges. 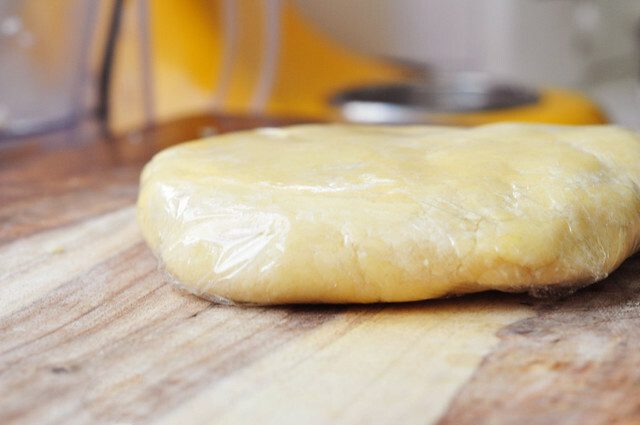 Using a sharp paring knife, trim dough flush with pan. Chill tart shell until firm, about 30 minutes. Preheat oven to 350°. Prick bottom of dough all over with a fork. Line with parchment paper, leaving at least a 1-inch overhang. Fill with pie weights or dried beans. Bake until edges are just beginning to turn golden, about 40 minutes. 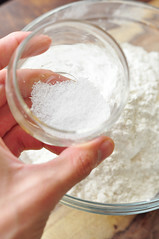 Remove parchment paper and weights. 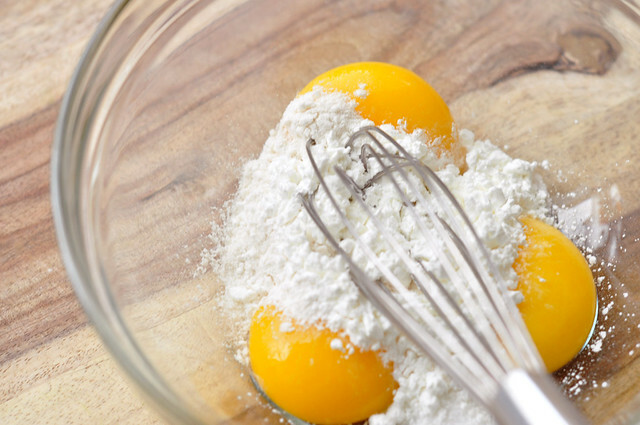 Whisk together the egg white with a tablespoon of water. Brush evenly on tart shell and return to oven. Continue baking until deep golden all over, 10 to 15 minutes. Cool tart shell completely on wire rack. 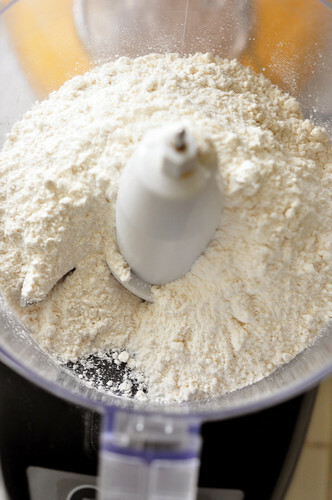 In the bowl of a food processor, combine flour and sugar. 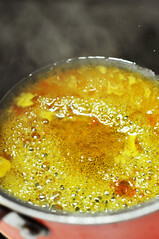 Add butter, and process until mixture resembles coarse meal, 10 to 20 seconds. 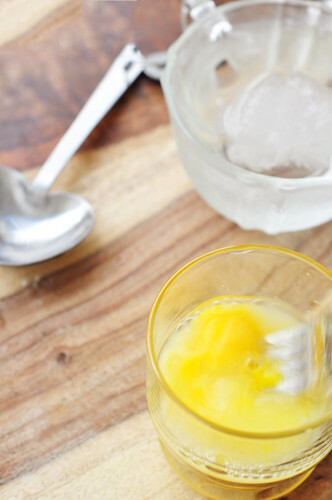 In a small bowl, lightly beat egg yolk; add ice water. 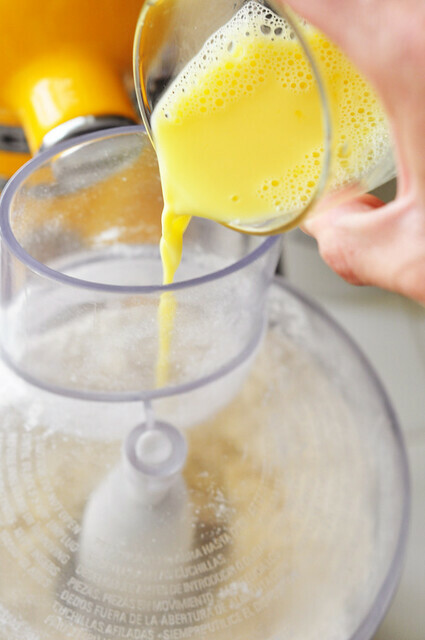 With machine running, add the egg mixture in a slow, steady stream through the feed tube. 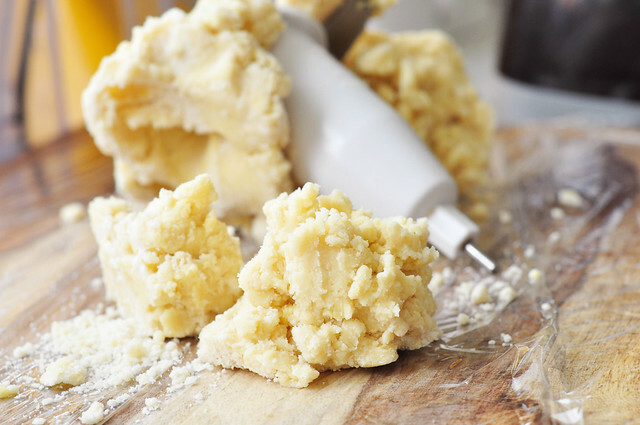 Pulse until dough holds together without being wet or sticky; be careful not to process more than 30 seconds. 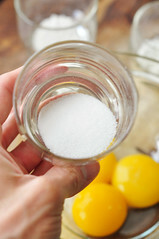 To test, squeeze a small amount together: If it is crumbly, add more ice water, 1 tablespoon at a time. 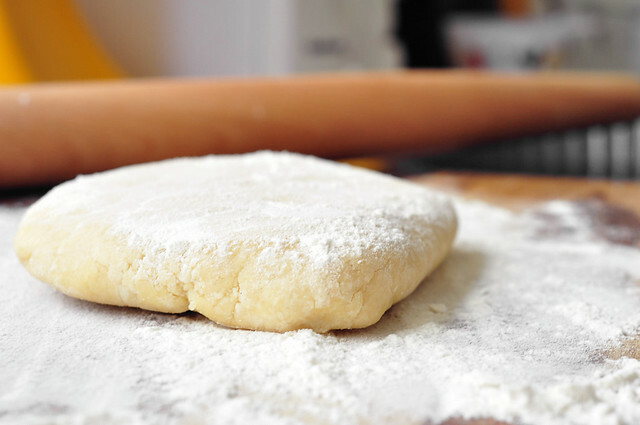 Flatten dough and ball into a disk. Wrap in plastic. Transfer to the refrigerator, and chill at least 1 hour. Preheat the oven to 350°. 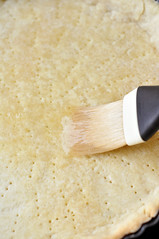 Butter an 9-inch cake pan, line the bottom with a round of parchment paper, and butter and flour the parchment. 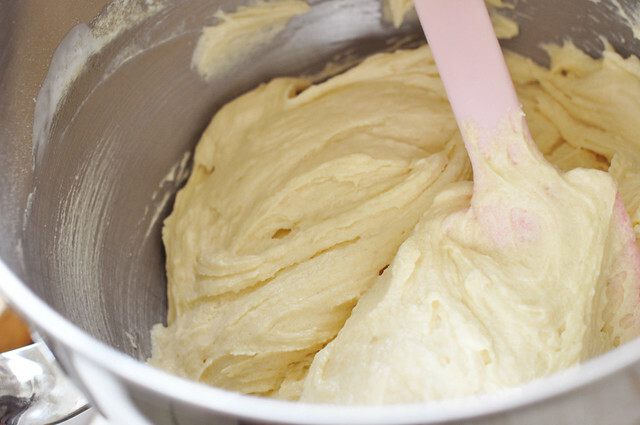 In the bowl of an electric mixer fitted with the paddle attachment, cream butter and sugar until light in color and fluffy, about 5 minutes. Add vanilla extract, and beat until combined. Add eggs, one at a time, beating until incorporated. 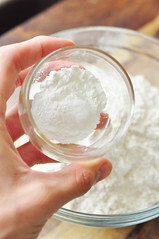 In a medium bowl, stir together flour, baking powder, and salt. 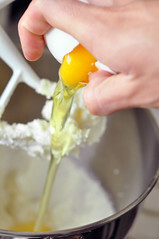 Add to egg mixture in three additions, alternating with milk, starting and ending with flour. 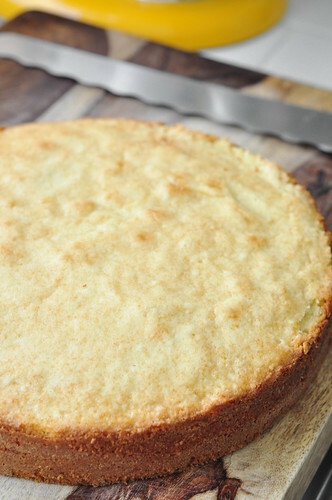 Pour the batter into the pan, and bake until the top is golden brown and a tester inserted into the center of the cake comes out clean, 45 to 50 minutes. Cool in the pan for 10 minutes. Turn out onto a wire rack, remove paper, and cool completely. Once cooled slice cake in half. 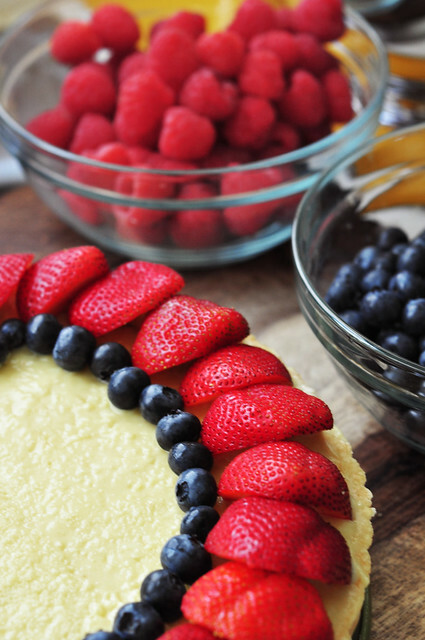 Place the cooled tart shell onto a plate or platter. 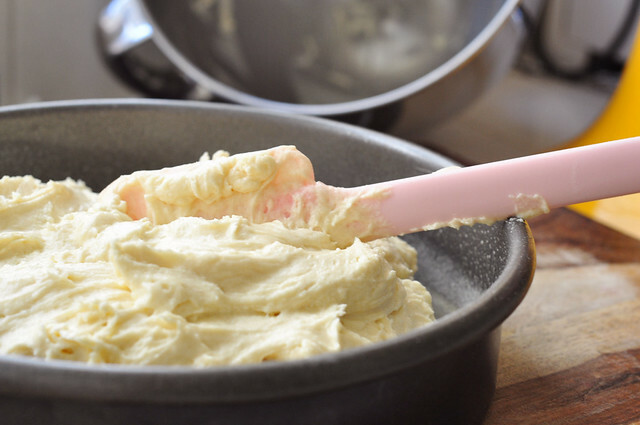 Spoon a dollop of the pastry cream and evenly spread it out. Top with a layer of cake. 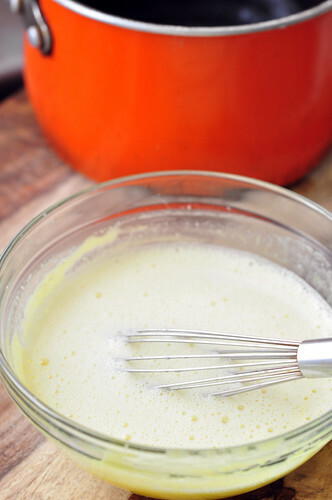 Pour the remainder of the cream and evenly spread it reaching the sides. 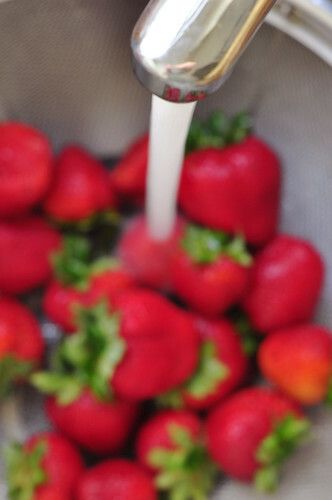 Arrange fresh berries any way you’d like. 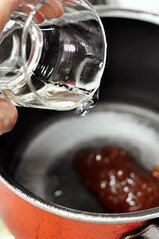 Pour the apricot preserves and water into a small sauce pan and heat until smooth and bubbling. 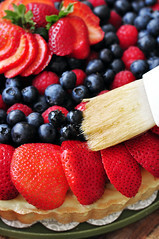 Using a pastry brush, while the glaze is hot, brush on top of the berries. 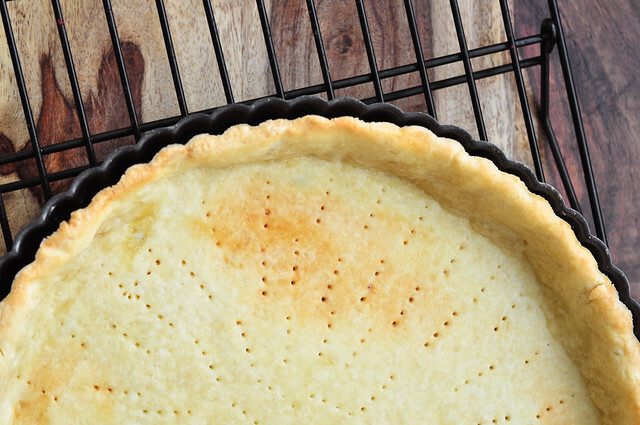 Once the top of the tart is glistening and shiny, you are ready to eat. Slice and serve right away. Place any leftovers in the fridge. Enjoy. Wow that came out amazing!!!!! Im jealous of the special treatment Your giving America, why can’t you make your sister a cake like that! what size of cake pan did you use for this? I am going to attempt to make this this weekend 🙂 Can’t wait! I used a 9-inch tart pan! Have fun making it! Let me know what you think!